For the fourth consecutive year, Research Infosource has named Lakehead Canada’s Research University of the Year in the undergraduate university category. 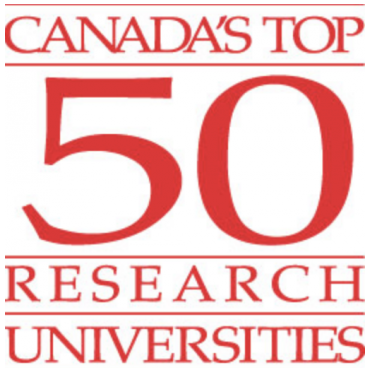 Lakehead’s placement at the top of the country’s undergraduate universities category is based on the university standing out on a balanced scorecard of research inputs and outputs, according to the annual ranking of Canada’s Top 50 Research Universities by Research Infosource, Canada’s source of research and development intelligence. This is the first time that a university in Research Infosource’s undergraduate category has been ranked Research University of the Year four times in a row. Dr. Moira McPherson, Lakehead’s President & Vice-Chancellor, welcomed the news, saying the announcement recognizes the value of the University's contributions to research. "Research at Lakehead University goes well beyond our on-campus labs and facilities," she explained. "Our researchers are active in communities around the world to help ensure the continued vibrancy of our economies, societies, and cultures." Dr. Andrew P. Dean, Lakehead University’s Vice-President, Research & Innovation, said earning Research University of the Year, again, was the result of the exceptional success and dedication of Lakehead’s researchers, and its Research Services and Economic Development and Innovation teams. “Being designated as Canada's Research University of the year for four years in a row is a strong testimony to the quality and diversity of research that is being conducted at Lakehead University,” Dr. Dean said. “We continue to have excellent research that is well cited and has an impact from fundamental research to applied research. I am particularly proud of the opportunities that our faculty provide to our students for exciting research projects. Our faculty continue to make significant contributions at a local, national and international level,” he said. Research Infosource’s calculation of its Research Universities of the Year involves examining several factors, including the total amount of sponsored research funding received by Lakehead University, research intensity per faculty (total research income per faculty member), research intensity per graduate student (total research income per graduate student), total number of publications, publication intensity, and publication impact. “Lakehead's success is no one-off result,” said Ron Freedman, CEO of Research Infosource Inc.
“Lakehead has achieved Research University of the Year status among Canada's undergraduate universities for four years in a row. That seems to put them in a unique category of achievement. It's a reflection of high quality scholarship and leadership at the university,” he said.